Greetings from the Windy City! I’ve spent the past four years in New York City, studying at Columbia University, and now I’m back in my hometown of Chicago as a contemporary art gallery curator. 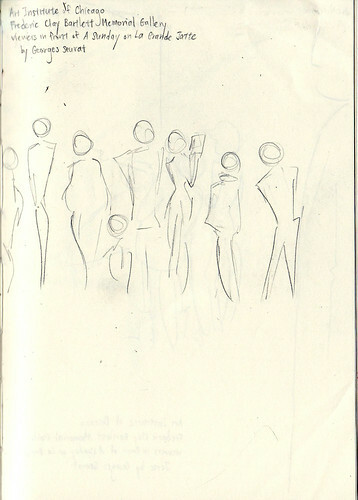 This was my first SketchCrawl, and I absolutely loved it. It’s such a fantastic idea not only to get us drawing, but also to see the world—and really, truly see it—through a new lens. In addition to future SketchCrawl events, I’ll try to go on unofficial sketchcrawls of my own! And since I did this official one solo, hopefully I’ll be able to organize a gathering of some sort next time around. All right. 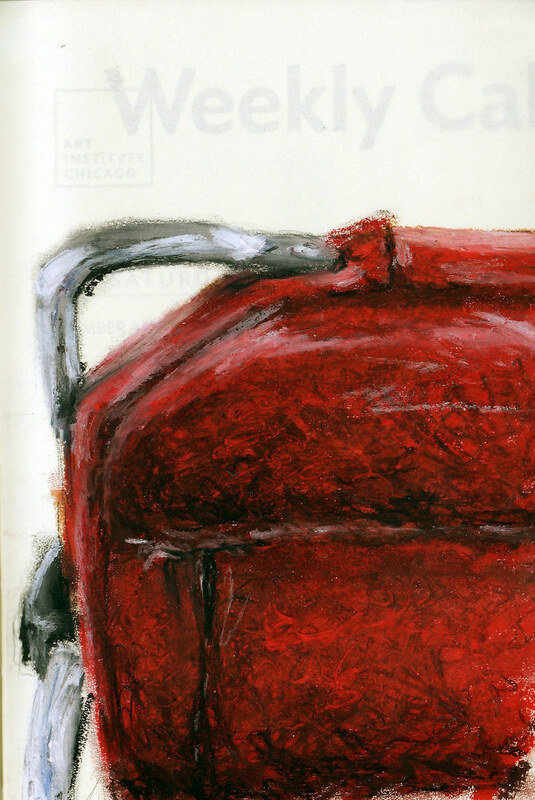 So I visited the Art Institute of Chicago, which provided free admission throughout the month of February (huzzah! a godsend for any recent graduate accustomed to freeloading off gratis university events). Outside, two bronze lions guard the staircase leading to the main entrance. Here's one urbanized Saharan king (I had to take off my mittens, of course—ah, the sacrifices we make for art). 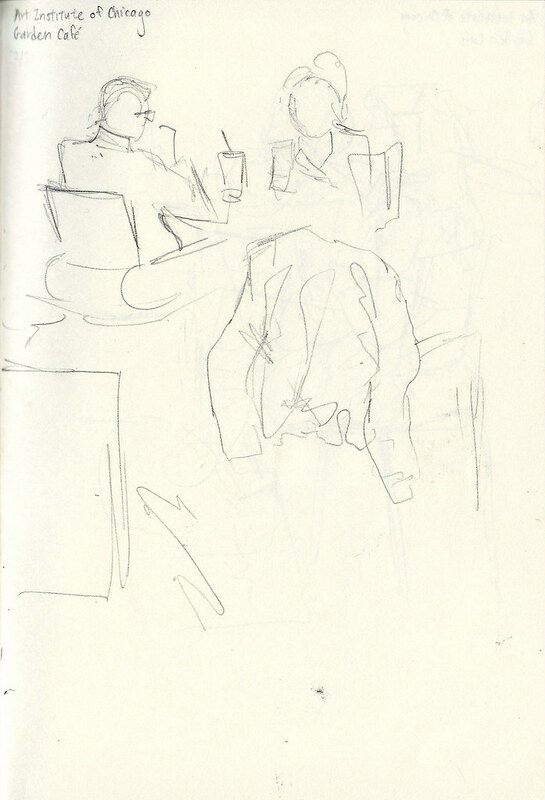 Taking refuge inside, I sketched the late lunch crowd in the museum café. 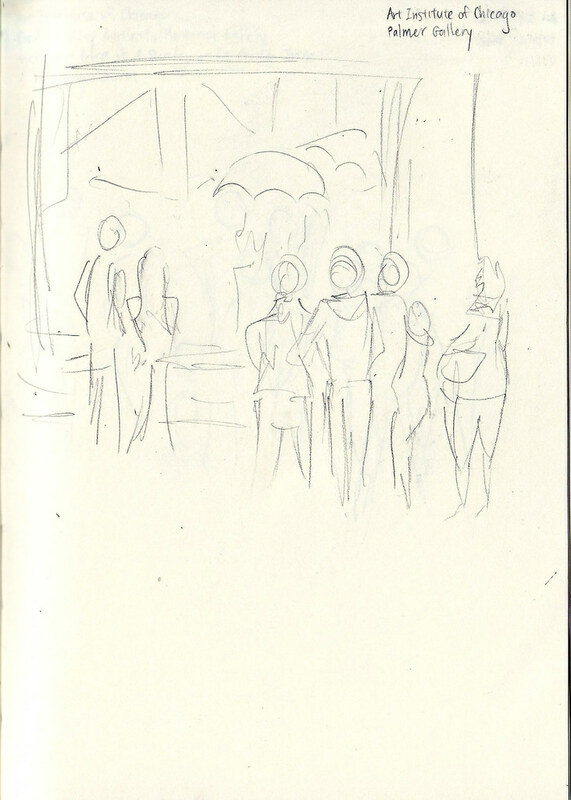 Here’s a sketch of a sculpture located within an indoor courtyard. 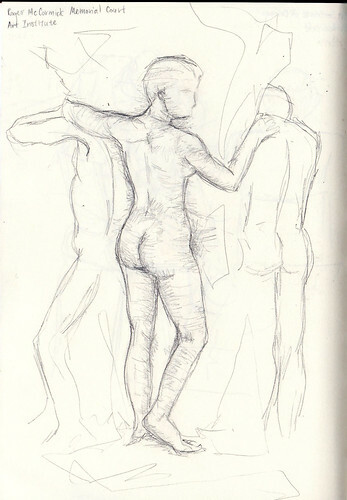 To my amusement, a security guard approached me mid-sketch, asked me what I was sketching (to which I replied, “…the sculpture I’m sitting in front of”), asked to see my ID, and then proceeded to hand me the following form to fill out (I blocked out personal information like my home address). Well, I suppose they need to take any and all safety precautions in case I was a spy for a rival art museum, or was planning an elaborate heist to steal the sculpture later that night and was therefore meticulously recording the dimensions... or something. Crisis averted, in any case. 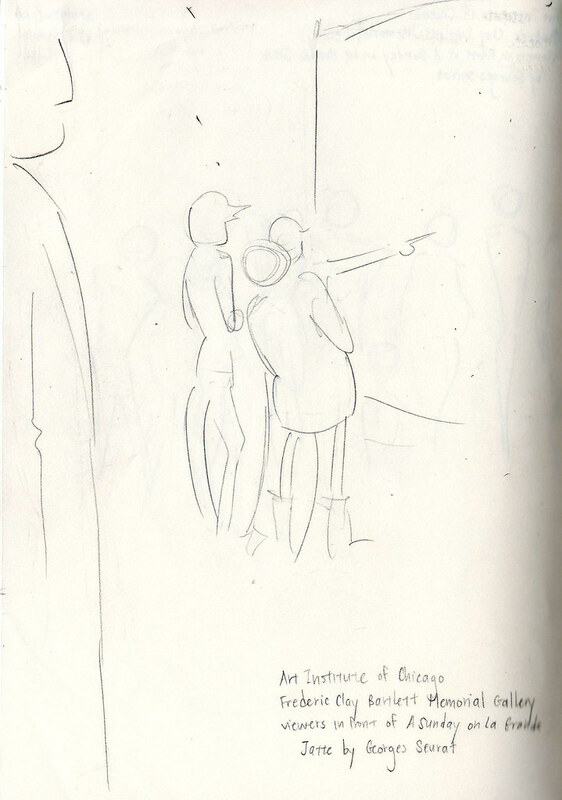 I then went into the gallery that housed the famed Paris Street; Rainy Day by Gustave Caillebotte, and did quick gesture drawings of the viewers in front of the work. It really was on a bike. My fingers about to fall off, I then hopped onto the El. (If you are unfamiliar with Chicago’s public transit system, the “El” gets its moniker from a unique feature; it spends much of its route above ground—elevated, if you will.) 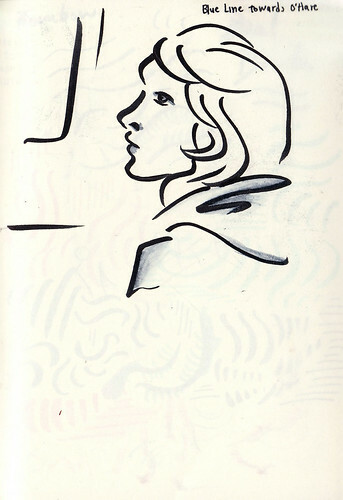 I played around with a new dual-tip brush by sketching a passenger inside the train. I warmed up and loaded up on caffeine (a university habit I’m afraid I won’t be able to shake for a while—or ever) at my favorite coffee shop, New Wave Coffee. There are many reasons why I love New Wave Coffee. Here’s one. On the El again, I realized I’d suddenly crossed international borders into iPod Nation. 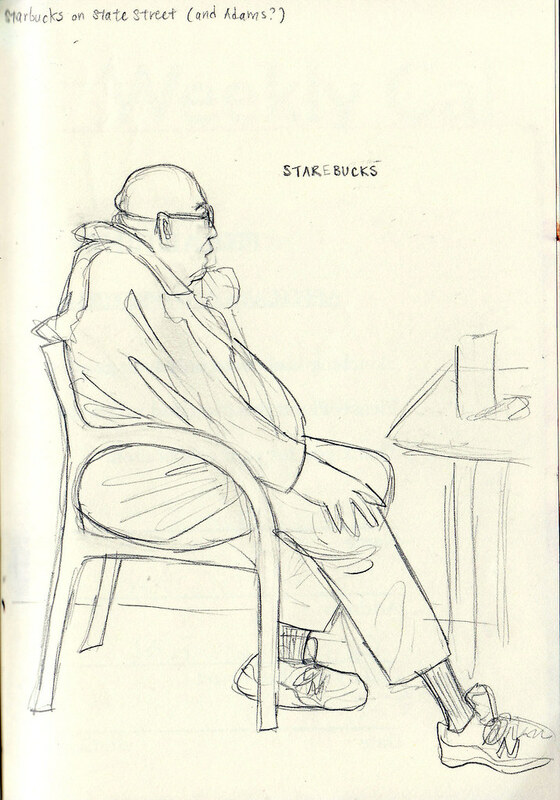 In a Starbucks inside the Loop (Chicago’s downtown area). A seat on the Metra train ride out of the city. After this splendid afternoon all to myself, I joined my extended family for my aunt’s birthday at her house. Now, if I had to name two things in this world that I deal very well with and can relate to on a transcendent level, they would be: children, and dogs. My three-year-old nephew (or is it cousin? He’s my cousin’s son. No matter; he calls me “Aunt Jenny” anyway, as if there needed to be any excuse to endear himself to me even more) was apparently afraid of the dog at that house. So, naturally, I helped the two become acquainted. Success! 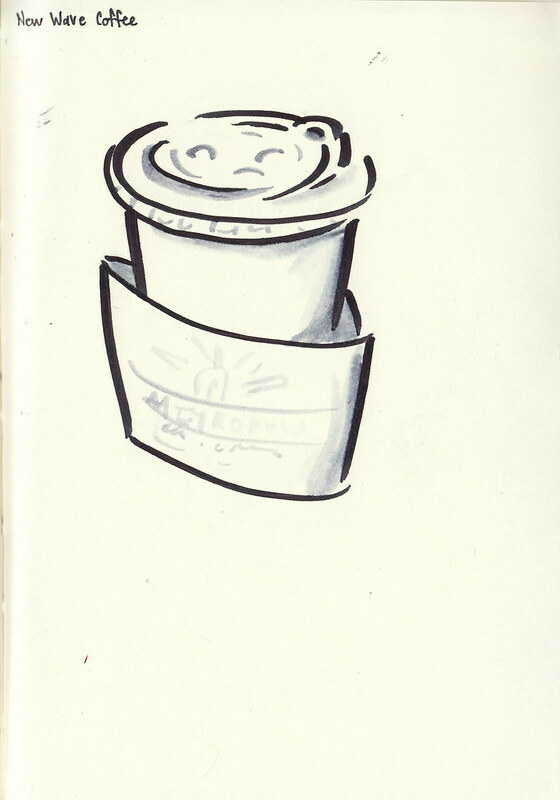 Thanks for looking through my sketches, and a huge thanks to those who created the worldwide SketchCrawl! Here’s to successful Crawls in the future. Ah ah, great retelling of your day ... loved it. Absolutely love the drawing of your cousin's son. Fabulous results Jenny, and so many. I love the way you write as well. I like your line work and your storytelling too! 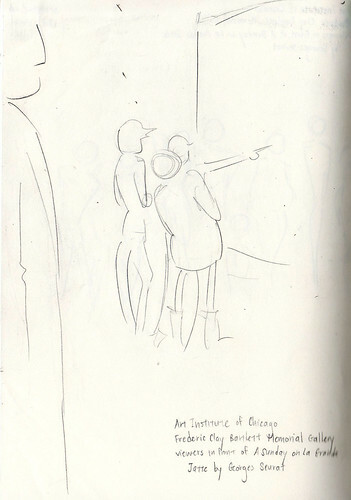 love these sketches and the anecdotes on your day. 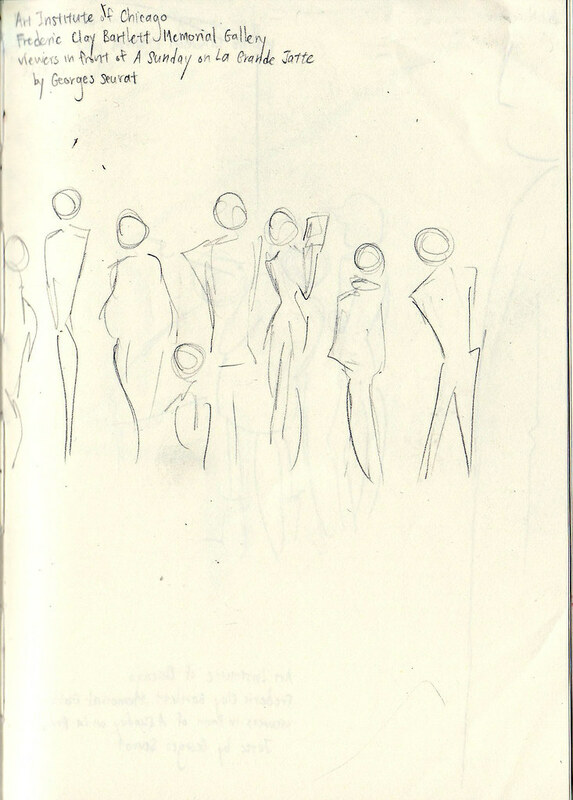 especially love the last sketch. lovely work Jenny and so many beautiful styles. 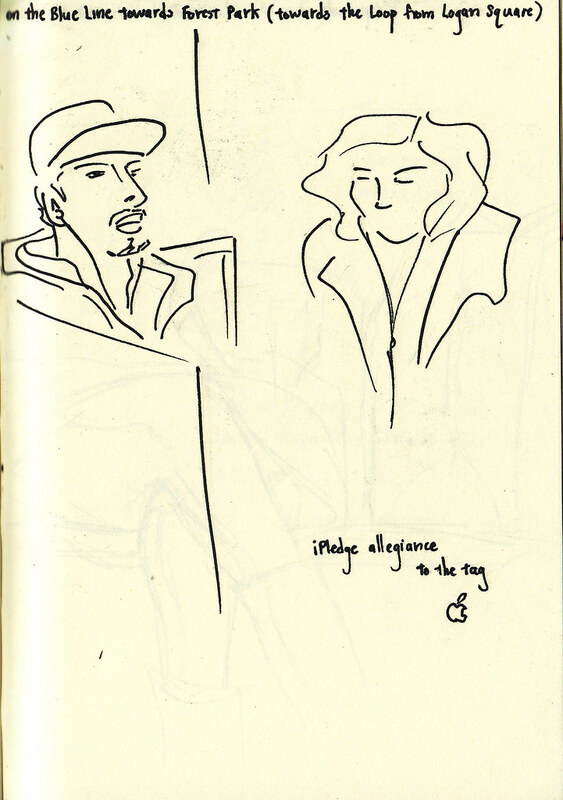 I love the metro seat and the lion - but also the quick sketches of people. 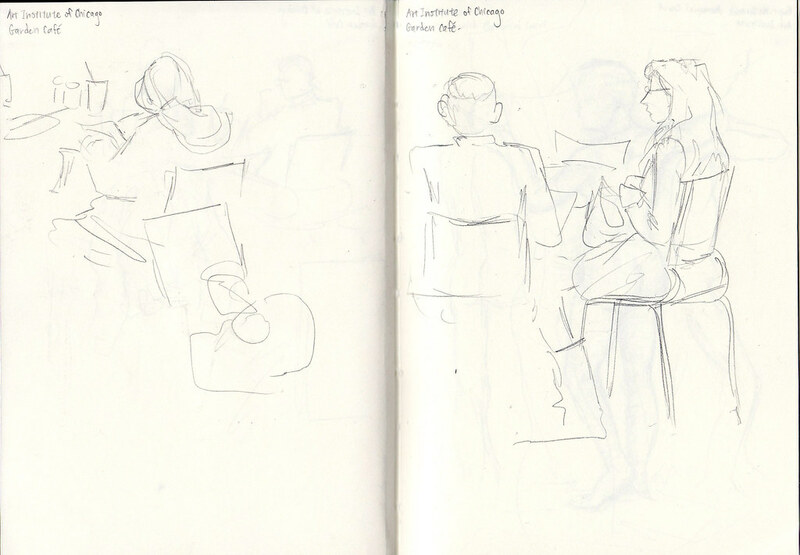 The quick sketches really capture the moment! The Art Gallery Rules are amazing. I know that many galleries have rules about what materials you can use inthe gallery , but never seen a form. Great drawings and writing! Very nice work braving the cold with the lion drawing. 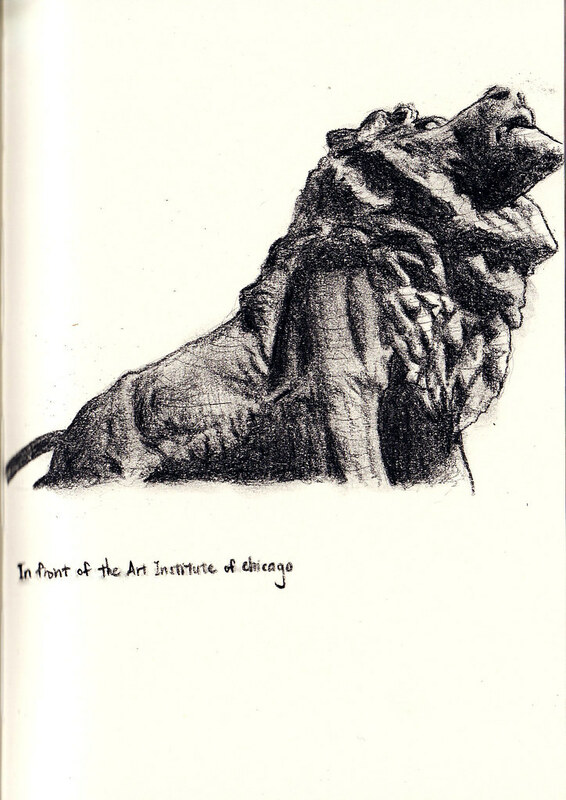 Chicago is a lovely city for sketching! nice work, these are really great---that seat on the Metra train is really cool. Great stuff Jenny, loved all your drawings and story telling. I enjoyed all your sketches, as well as your great commentary. Nice body of work. You had one long day of sketching! 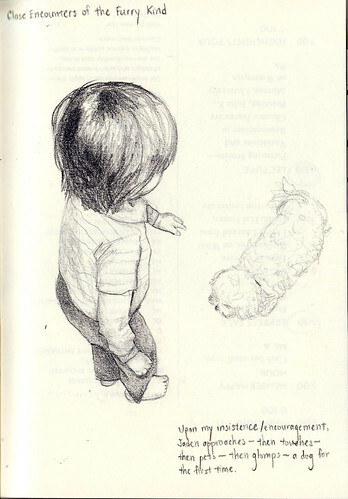 I love your first sketch of the lion and the last one of the little boy and dog. 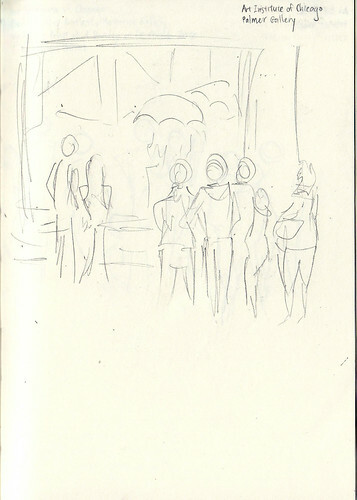 Super sketches at the museum...funny how they had you sign a form. 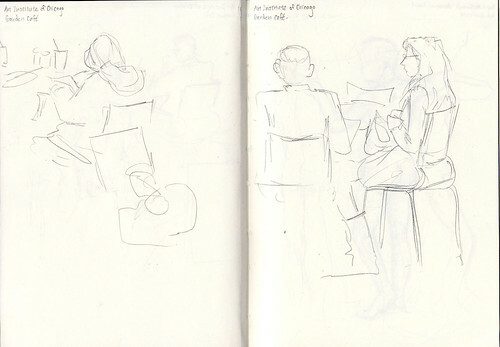 You way of describing the day was as almost as much fun as the sketches. great sketches of different style and lovely story to match, love your brush pen especially but also admire the lively lines just as much..
you must have had a very long sketccrawl - or have been really fast and productive - or possibly both ! I love the lion,of course the application form - and I think I have seen the "bike show" - not far from the museum, it was lovely, with music, right ? Anyway, the metra seat is phantastic - and one can really tell the tentative approach between nephew and dog. 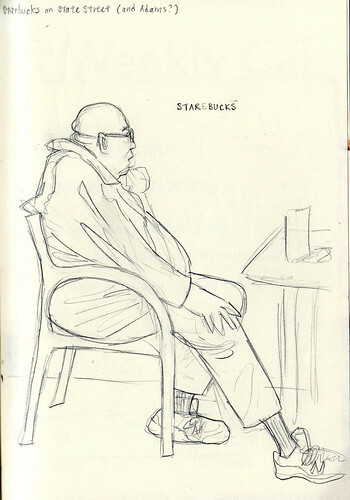 Hope you find fellow sketchers soon - wish I had been sketching when I spent 3 months in Chicago back in early 2007 ! Thanks for all the kind words, everyone! I do love storytelling/writing as much as I love drawing/illustrating. Karin - Yes, the puppetshow did have music! I just visited the website advertised on the bike: http://www.puppetbike.com. So great.